I was recently making significant additions to a PLC program and the resulting program was too big to fit in the existing PLC. There weren’t many areas where the code could be made smaller without impacting readability, so I went out and priced the same series of PLC with more memory. I’m not going to name brands or distributors here (and I’d probably get in a lot of trouble if I did, because they don’t publish their prices), but I was taken aback by one thing: the only difference between these two controllers was the amount of memory (execution speed and features were the same), and it was over $1000 more. I realize this is “industrial” equipment, so the memory probably has increased temperature ratings, and it’s battery backed, but how much PLC memory can you buy for $1000? As of writing this post, the cost of 1 Gibabyte of memory for a desktop computer is less than $50. At $50 per Gig, 20 Gigs of PLC memory? Nope. Ok, it’s industrial, so… 1 Gig? Nope. Try less than half a Megabyte. Yes. Just for the sake of comparison, how much is that per Gigabyte? If half a Meg costs $1000, then the price of PLC memory is 2 Million dollars per Gigabyte. WTF? It’s not 40 times more expensive, it’s forty thousand times more expensive than commodity RAM. Rewriting the program because the languages are not portable. Modifying the electrical drawings significantly. Retraining all of my existing maintenance and engineering staff on the new platform. So it really doesn’t matter. They could charge us $5000 for that upgrade and it’s still cheaper than the alternative. Why don’t they publish their prices? Simple, they price it by how much money they think you have, not by how much it costs them to produce the equipment. Wouldn’t we all like to work in an industry like that? How did it get this way? In the PC industry, if Dell starts charging me huge markups on their equipment, I can just switch to another supplier of PC equipment. Even in the industrial PC world, many vendors offer practically equivalent industrial PCs. You can buy a 15″ panel mount touch screen PC with one to two gigs of RAM for about $3000. Add $500 and you can probably get an 80 Gig solid state hard drive in it. Compare that with the fact that small manufacturing plants are routinely paying $4500 for a 10″ touch screen HMI that barely has the processing power to run Windows CE, and caps your application file at a few dozen megabytes! Nearly every subsystem of a modern PC is based on a well defined standard. All motherboards and disk drives use the same power connectors, all expansion cards were based on ISA, or later PCI, and AGP standards. External devices used standard RS232, and later USB ports. Hardware that wasn’t interoperable just didn’t survive. That first graph is exactly like where we are now in the automation industry with PLCs. None of the vendors have opened their architecture for cloning, so there’s no opportunity for the market to commoditize the products. Let’s look at this from the point of view of a PLC manufacturer for a moment. Opening up your platform to cloning seems like a really risky move. Wouldn’t all of your customers move to cheaper clones? Wouldn’t it drive down the price of your equipment? Yes, those things would happen. The hardware cost of your platform would drop, so everyone would leave your competitor’s platforms and come to yours. At least you’d still be in the game, but your competitors wouldn’t even have a compatible platform anymore. By dropping the price of automation equipment, the demand for complementary products would increase. IBM didn’t make its fortune directly in the PC industry, but they rode the wave and became an enterprise services company built on top of the commodity PC business. The size of the industry would explode. Why don’t we have open standards? What about IEC-61131-3? PLC vendors tell us that their controllers are IEC 61131-3 compliant, but that doesn’t mean they’re compatible. The standard only specifies what languages must be supported and what basic features those languages should have. Why didn’t the committee at least specify a common file format? You may be surprised to learn that many of the major committee members were actually from the PLC equipment manufacturers themselves. The same people who have a vested interest in maintaining their own vendor lock-in were the ones designing the standard. No wonder! What about the new XML standard? Well, it’s being specified by the same group and if you read their documentation, you can clearly see that this XML standard is not meant for porting programs between PLC brands, but rather to integrate the PLC programming tools with 3rd party programs like debugging, visualization, and simulation tools. You can be certain that a common vendor-neutral file format will not be the result of this venture. A single integrator or manufacturer could develop and create an open automation platform and put the rights in the public domain. Option 1 is almost doomed to fail because it has the word committee in it, but options 2 and 3 (which are similar) have happened before in other industries and stand a good chance of success here. In my opinion, the most likely candidate to fulfill option 2 is Beckhoff. I say this because they’ve already opened up their EtherCAT fieldbus technology as an open standard, and their entire strategy is based around leveraging existing commodity hardware. Their PLC is actually a real-time runtime on a PC based system, and their EtherCAT I/O uses commodity Ethernet chipsets. All they would really need to do is open source their TwinCAT I/O and TwinCAT PLC software. Their loss of software license revenue could be balanced by increased demand for their advanced software libraries in the short term, and increased demand for their EtherCAT industrial I/O in the longer term. Since none of the other automation vendors have a good EtherCAT offering, this could launch Beckhoff into the worldwide lead relatively quickly. For option 3, any company that considers automation equipment to be an expense or a complementary product (i.e. manufacturing plants and system integrators) could do this. There is a long term ROI here by driving down the cost of automation equipment. Many internet companies do this on a daily basis. IBM sells servers and enterprise services, which is the natural complement of operating systems, so they invest heavily in Linux development (not to drive down the cost of Linux – it’s free – but to offer a competitive alternative to Microsoft to keep Microsoft’s software costs down). Google does everything it can to increase internet usage by the public, so it invests heavily in free services like Google Maps, Gmail, and even the Firefox web browser. The more people who surf, the more people who see Google’s advertising, and the more money they make. Base it on commodity PC hardware (x86). Pick an open source, free real time operating system like FreeRTOS. Document and publish (free download) the communication protocol and file format for the automation program files (e.g. ladder logic). Write a reference runtime that conforms to this communication protocol and publish it under a BSD license. It doesn’t have to be great, but it has to work and be useful. Write an extensible programming environment (Windows-based) where you can develop automation programs that conform to the standard and that communicates with any runtime that conforms to the standard. Give it away free and publish it under the GNU GPL license to prevent it from being embraced and extended in a proprietary way by one vendor. If you did that, anyone could make hardware that’s compatible with this platform, people are free to innovate on the runtime, and anyone can make improvements to the programming environment (as long as they give their changes back to the community). Instant de-facto standard. I know some of you may be grinning right now because this is the path I’m following with my next personal software project, that I’m calling “Snap” (which stands for “Snap is Not A PLC”). However, Snap is for the home automation industry, not the industrial automation industry. If any company out there wants to take up the gauntlet and do this for industrial automation equipment, you may just change this industry and solve our biggest problem. Discussion is welcome. Please comment below or contact me by email ([email protected]). * Graphs courtesy of ars technica. A few years ago I wrote a program for a customer using a flowcharting language. It wasn’t just a flowcharting language; the product allows you to use both relay ladder logic and flowcharts. But the customer had a software standard that made the use of ladder logic forbidden! Imagine a simplified example. Do you think Bill Gates’ kitchen has a blender? Probably. But it’s probably not like the one you or I have. Maybe it’s made out of solid gold and maybe it has a nuclear power source, but most of all I imagine it has a fully fledged industrial control system. Now, imagine we’re programming the control system for this blender. Of course it would have the standard start and stop buttons, but this blender is top of the line and absolutely safe. It has a sensor to determine if the lid is closed. Obviously, if we’re happily blending away and the lid flies off, we need to stop the blender, and it shouldn’t start again until the lid is back on and the start button is pressed. After all, we wouldn’t want to endanger Bill’s fingers or anything (I happen to know he does a lot of blending). Good job! No matter what happens, the lid will have to be closed or the motor simply won’t run. Of course, the software specification says that you can’t use ladder logic. That’s pretty simple, but it doesn’t take the lid closed switch into account. At first glance, we might have to put the check for the lid closed before every decision block, so we check for the state of the lid switch, then check for the start or stop buttons. Do you see how this could get out of hand quickly? How’s that? While it’s true that if the lid ever comes off, the motor will stop, we have no way to exit gracefully. This “exception block”, as it’s called, stops whatever you were doing, turns off the motor and starts the whole process over again. I’m sure it would work fine for our simplified example here, but what if we were doing something else later on in the flowchart? What if we were tracking parts, or decelerating an unrelated axis? 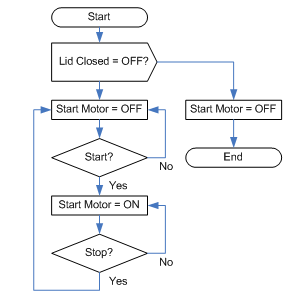 In the ladder logic example, the lid switch only disables the motor. 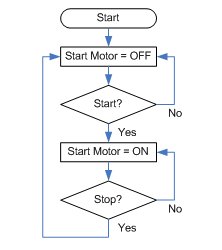 In the flowchart it stops the logic and then disables the motor. Of course, to deal with this problem in the complexities of a real machine, you end up writing two different flowcharts: one for the sequence and one for the outputs. Now take a close look at the right hand flowchart. It scans through both decisions on every single scan of the controller. It’s “ladder logic written sideways”. It’s simple combinational logic that screams to be rewritten in ladder. 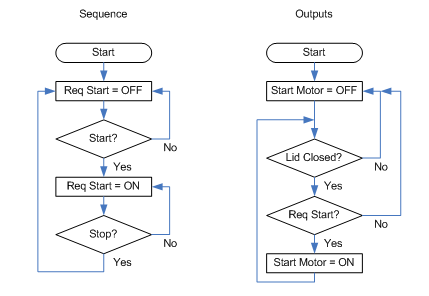 In fact, writing the state logic (like auto mode sequences) in flowchart and the combinational logic (like manual mode and faults) in ladder makes a lot of sense, especially for more complicated machines. So why forbid ladder logic? Perhaps it was just to force people to start using the flowcharts. A software standard that bans ladder logic is a bad idea. Some logic is more readable as flowcharts, and some is more readable in ladder. For years we’ve had to write everything in ladder. We were like the little boy who only had a hammer and thought every problem was a nail. If that boy suddenly traded the hammer for a screwdriver, was he any better off? They’re a lot like those dumb laws you hear about in your email inbox like, “You cannot chain your alligator to a fire hydrant.” You know this law only exists because someone, at some point, chained their alligator to a fire hydrant. Some of these dumb standards exist because they are no longer relevant. Dumb standards keep hanging around because we are so concerned about telling people what to do that we forget to say why. Maybe this is because it seems obvious at the time. After replacing the fifth monkey, none of the monkeys had ever been sprayed with water. Still, no monkey ever approached the steps. Why not? Because as far as they knew it was the way it had always been done around here… and that is how company policy begins. Another co-worker of mine would say that this situation exists because the monkeys are only passing on data, not knowledge. The monkeys have created a culture that is immutable to change because the culture rewards following and enforcing the rules more than understanding why the rules exist. Standard 10.3(a) sub. 5: All wires will be terminated with ferrules. I can imagine why this standard might exist – too many hours spent troubleshooting electrical problems caused by loose wire strands shorting out on nearby terminals. But if you’re a brand new employee straight out of school, would you understand that’s why this standard exists? When people don’t know why, they tend to make up their own reasons. What happens two decades down the road when we’re all using carbon nanotube wires or some other non-stranded alternative? Without knowing why the standard exists, we might try to enforce this standard in a way that doesn’t make sense. Without a clear why stated, we risk allowing this standard to become another dumb standard, making the company less efficient. So please, let’s make a new standard for future standards. Every time you write a standard, include a short paragraph with it describing the history of the decision and the reasoning behind it. Take the opportunity to pass on your knowledge!